This is a notice that we will be scheduling the Wild Weekend games 2 hours earlier this coming weekend (or Friday and Saturday). The purpose is to allow some of the European members a better chance to play. 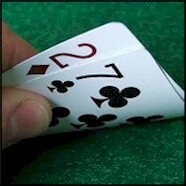 They will still be deep stack games of No Limit Holdem. Hopefully everyone can readjust their schedules for this event. I also sent this notice via a newsletter from the forum. If you did not get this notice, please check your Profile Preferences to allow newsletters in the future. In addition, we have had an excellent suggestion. We will also make available a cash table which will be open for all players who either did not get the message, or just want to continue playing. I hope I'm in this weekend so I can play at last. A cash table? or ring table? or Both? Yeah "Cash" was a Freudian slip. freud wear s a slip??? thanks for the 2 early games johnny 14 players both nights hope you keep them at this time. Sorry Gang I will have to miss the game tonight. But I will be there tomorrow. No worries JO! Family 1st! CU Tomorrow! I'm only telling you this because I thought today was Sunday and I've been reminding everyone to play Listeners tny... duh. I would like to bring attention to a slight change in the schedule. For the month of August we have moved the Wild weekend games to Saturday and Sunday, instead of Friday and Saturday. Although the earlier time works for a variety of people the early start on Friday was not good for some members. The weekend days are better. This is a notice that we will be re-scheduling the Wild Weekend games back to their original time slot. The reason is that the early games have shown a marked decrease in attendance. I will still add an early game on Sundays, for those in the early time zones, but the late game will be at 9:00 PM EST. Hopefully everyone can readjust their schedules for this return. it wos nice of you to make the change johnny but a new they woodent work.